Bureau of Entomology and Plant Quarantine Washington, D. C.
of the Republic of Ecuador has been prepared for the information of exporters of domestic plants and plant products to that country, and for plant quarantine officials. 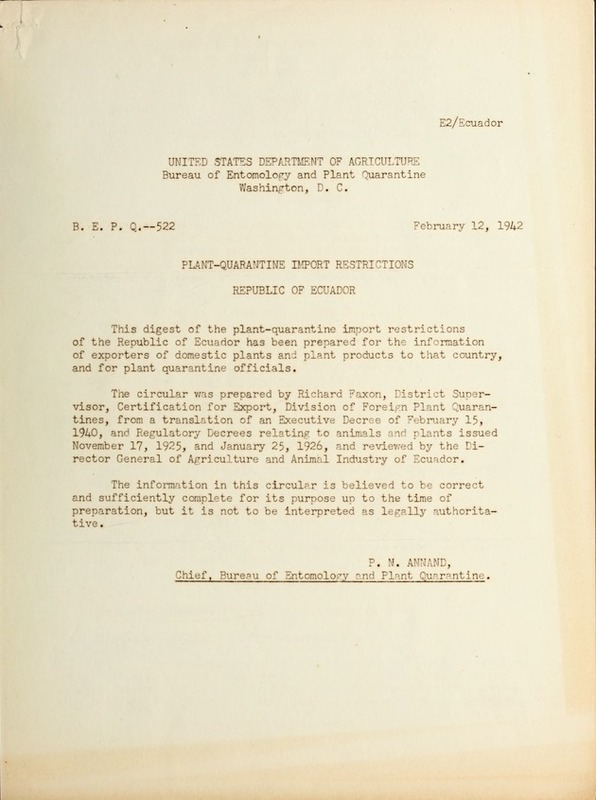 The circular was prepared by Richard Faxon, District Supervisor, Certification for Export, Division of Forei, n Plant Quarantines, from a translation of an Executive Decree of 7-:ruary 15, 1940, and Regulatory Decrees relating to animals adc plants issued November 17, 1925, and January 25, 1926, and reviev:ed by the Director General of Agriculture and Animal Industry of Ecuador. The information in this circular is believed to be correct and sufficiently complete for its purpose up to the time of preparation, but it is not to be interpreted as legally authoritative. ChiefP. Bureau of Entomol nd PlAnt ur,ntine. Chief, Bureau of Entomolo0 y a nd Plant Quarontine. UNITED STATES DEPARTMENT OF AGRICULTURE Bureau of Entomology and Plant Quarantine Washington, D. C.
plant and animal health regulations, and provided for the establishment of a phytosanitary service charged with the inspection of plants, This service administers regulations issued November 17, 1925 (effective January 1, 1926), and January 25, 1926, in relation to importations of plants and plant products. COTTONSEED, COTTON BOLLS, OR RA1! COTTON from countries infested with the cotton boll weevil (Anthonomus grpndis Boh,). PLANTS AND PLANT PRODUCTS for planting or propagation in Ecuador from infected regions. HAY OR STRAW, LIVE PLANTS, SEEDS, CUTTINGS, SPROUTS, BUDS, RAFTS, ETC., must be accompanied by a phytosanitary certificate. PARCEL-POST SHIPMENTS OF SEEDS, CUTTINGS, ETC., must be certified to be in healthy condition by the shipper. Article 1. Relates to animal quarantines. In the particular case of cottonseed, cotton bolls, nnd raw cotton, the certificate visaed by the consul must state under oath or formal declaration, that the bolls or seeds come from a country in which the cotton boll weevil (Anthonomus grnndis Boh.) does not exist. Art. A. Consular authorities, Customs inspectors, the Smuggling Patrol, and Postmasters are entrusted with the fulfillment of these regulations. Art. 5. Customs inspectors and postmasters are required to notify the De-oartment of Agriculture of all importations of plants, seeds, etc., passing through their offices, and to send a copy of the certificate -ccompanying such shipments handled by them with each notification. Art. 2. Postmasters are required to send copies of such certificates to the Denartment of Agriculture. diseased, or infested with insects by the addressee, he shall notify the Department of Agriculture i=pmdiately. In case further examination by Department inspectors confirms his report, the result of the inspection will be published in the Official Bulletin of the Deprtment. Art. 4. In the event th-t p.rrcel-post packages containing seeds, plants, etc., arrive without health certificates of any kind, the postal authorities must advise the Deprtment of Agriculture, or the nearest plant inspector, by telgraph, giving necessary details of the shipment and hold satm for disposition by the plant-inspection authorities. official crtific-tos will b supplied fr>e of charge.